ALS Research Forum | SfN 2010: San Diego: Mutant SOD1 Bumps Mitochondrial Current Up—Or Down? SfN 2010: San Diego: Mutant SOD1 Bumps Mitochondrial Current Up—Or Down? Mutations in superoxide dismutase-1 (SOD1), which lead to amyotrophic lateral sclerosis, cause SOD1 to buddy up with mitochondrial proteins and interfere with normal mitochondrial conductance. Researchers expanded their understanding of these interactions as described in posters at the Society for Neuroscience annual meeting, held 13-17 November 2010 in San Diego, California. Two groups presented results that laid out how mSOD1 interacts with the normally protective Bcl-2 and the mitochondrial voltage-dependent anion channel (VDAC) to alter ion traffic across the outer mitochondrial membrane. Using different techniques, scientists in the laboratories of Piera Pasinelli at Thomas Jefferson University in Philadelphia, Pennsylvania, and Don Cleveland at the University of California in San Diego acquired somewhat contradictory results with respect to SOD1/Bcl-2/VDAC interactions. They agree that somehow or other, mSOD1 interferes with mitochondria, and that can’t be good. Some 1 to 2 percent of SOD1 localizes to mitochondria (Pasinelli and Brown, 2006), where it binds to the outer mitochondrial membrane in general (Vande Velde et al., 2008) and to Bcl-2, a pro-survival pore protein, in particular (see ARF related news story on Pasinelli et al., 2004 and Liu et al., 2004). Researchers in the Pasinelli lab recently showed that mSOD1 twists Bcl-2 into a new conformation, exposing a toxic BH-3 domain (see ARF related news story on Pedrini et al., 2010). Nicole Naniche, working with Pasinelli, followed up on that research, adding VDAC/Bcl-2 binding and altered mitochondrial conductance to the story. Naniche mainly used HEK293T human embryonic kidney cells as a model. These cells do not normally express Bcl-2, so Naniche was able to compare Bcl-2-negative cells to those that she stably transfected with the gene for the pore protein. She treated the cells for half an hour with recombinant SOD1-G93A and looked for mitochondrial cytochrome c release, an indicator of mitochondrial dysfunction. Mutant SOD1 had little effect on the Bcl-2-negative cells, but in the Bcl-2-expressing cells, it doubled the cytochrome c output. In addition, she found that co-transfecting both SOD1-G93A and Bcl-2 deformed mitochondria, disrupting membranes and causing vacuolization, which did not occur in cells expressing mSOD1 only. Bcl-2 was recently shown to bind the outer mitochondrial membrane anion channel VDAC (Arbel et al., 2010), so Naniche wondered if mutant SOD1 would alter the interaction between the two. She confirmed Bcl-2/VDAC binding in N2A mouse neuroblastoma cells by co-immunoprecipitation. When she transfected the cells with wild-type or mutant human SOD1, she discovered that SOD1-G93A boosted not only the Bcl-2/mSOD1 interaction, but also the binding between Bcl-2 and VDAC. The researchers were unable to co-immunoprecipitate mSOD1 and VDAC, so they suspect that mSOD1 boosts the Bcl-2/VDAC interaction without touching VDAC itself. What about in vivo? To examine the interaction in animals, the researchers traced the Bcl-2/VDAC partnership in ALS model mice carrying the human SOD1-G93A gene. 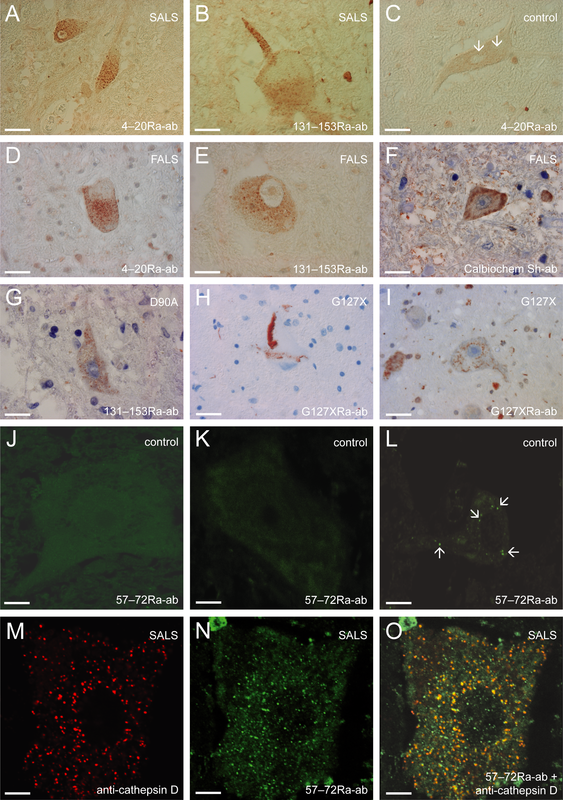 Naniche isolated spinal cord mitochondria from animals at pre-symptomatic stage, disease onset, mid-disease, and end stage. As the disease progressed, the amount of VDAC pulled down in Bcl-2 immunoprecipitates steadily increased, suggesting this interaction is somehow associated with disease progression. Naniche and colleagues suspected that the mSOD1-Bcl-2 interaction would have functional consequences for mitochondria, so they isolated the organelles from HEK293T cells for patch-clamp studies of ion conductance. In the control, Bcl-2-negative cells, the addition of SOD1-G93A had no effect on outer mitochondrial membrane (OMM) conductance. But in Bcl-2-positive mitochondria, mSOD1 increased conductance. This difference in ion exchange could be from any channel, not necessarily VDAC, the authors noted. They suspect this altered conductance could be detrimental to mitochondrial activities. Just around the corner from Naniche’s poster, Adrian Israelson from the Cleveland lab presented his own data on the mSOD1/VDAC partnership (see ARF related news story on Israelson et al., 2010). At first glance, the two posters seemed to clash. Israelson’s data say that mSOD1 binds VDAC directly and blocks the channel, reducing its conductance. Israelson told ARF that, unlike the Pasinelli group, he has been unable to see a Bcl-2/SOD1 interaction by co-immunoprecipitation. This dovetails with previous research (Gould et al., 2006). Israelson and colleagues also recently found that mSOD1 does not require VDAC to bind the outer mitochondrial membrane; mSOD1 also interacts with mitochondrial protein import machinery (Li et al., 2010). Despite the discrepancies, both sets of authors agree that it is inappropriate to compare the research side-by-side. The experimental conditions used in our work are very different, Pasinelli wrote in an e-mail to ARF. She suggested the groups should compare technical notes before drawing conclusions. Immunoprecipitation conditions—including the specific antibodies used—could explain the different co-IP results, Pasinelli wrote. The mitochondrial voltage methods were also different. Naniche used purified mitochondria, while Israelson put VDAC alone into reconstituted, artificial lipid bilayers. This means that the experiment is very clean, he wrote in an e-mail to ARF. On the other hand, this means that many other factors that might influence the OMM conductance are not tested. Either way, both groups agree that mSOD1 alters mitochondrial current. The bottom line is that, if there is a change in the current, this can certainly affect mitochondria, said Giovanni Manfredi of the Weill Medical College of Cornell University in New York, New York, who was not involved in either study. It will affect mitochondrial metabolism. In addition, Manfredi noted that mSOD1 not only causes problems on the outer mitochondrial membrane, it also gets into the matrix where it likely leads to other damage. How to rein in damaging misfolded SOD1? Researchers at Brandeis University in Waltham, Massachusetts, suggest a possible treatment in a paper published online by PNAS November 22 (Auclair et al., 2010). The team, led by first author Jared Auclair and senior author Jeffrey Agar, sought to chemically stabilize the wayward protein. Researchers have theorized that, once settled in its healthy dimer formation, mSOD1 would be less able to partner up with other proteins and cause damage (see ARF related news story). Using both the sulphydryl compound, maleimide, and thiol-disulfide exchange, Auclair and colleagues cemented the monomers’ cysteines together, stabilizing the dimer. The authors suggest this might be a potential route for treating mSOD1-based ALS.